Are you a Newcomer to leadership? Do you dream about making a difference? In your community? Your workplace? In the Global Village? 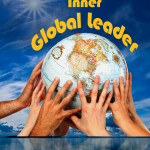 Yes, it’s time to Inspire Your Inner Global Leader! Here are True Stories for New Leaders who are passionate about shaping the future. Deborah Levine’s storytelling blends family, history, humor and training in a Can’t-Put-It-Down Guide. The stories include letters and diaries from the German front during World War II, eye-witness accounts of the early years of the women’s movement, of immigrant experiences and lessons from those with disabilities. Use the stories to chart your course to global leadership. Be inspired to explore the possibilities, articulate the ‘what ifs’, and create new paths to making a difference. We begin the journey to Global Leadership with awareness. The stories and heroes that surround us everyday guide us by example. The key to your transformation into a Global Leader is as close as your personal history and that of the people close to you. 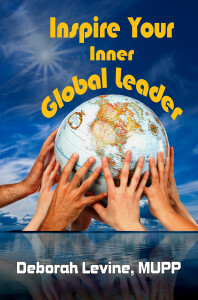 Each chapter in Inspire Your Inner Global Leader is a true story designed to light your path from Newcomer to Expert, from Dreamer to Future Leader. The CULTURE TIPS are road signs guiding your steps and the NEWCOMER COMMENTS keep you company along the way. The BLOG FOOD questions give you energy for the trip. 13. Who is Really Disabled?